AQUAOX™ On-site Electrochemical Activation (ECA) generators produce a comprehensive line of non-toxic, biodegradable, safe-to-use, fast-acting healthcare-grade cleaners and disinfectants. These solutions clean and degrease surfaces, destroy pathogens, viruses, algae, fungi and are non-toxic, eco-friendly, fast acting and safe to use. Our automated systems can be used as a stand-alone system or as part of an integrated system in your company’s production process. 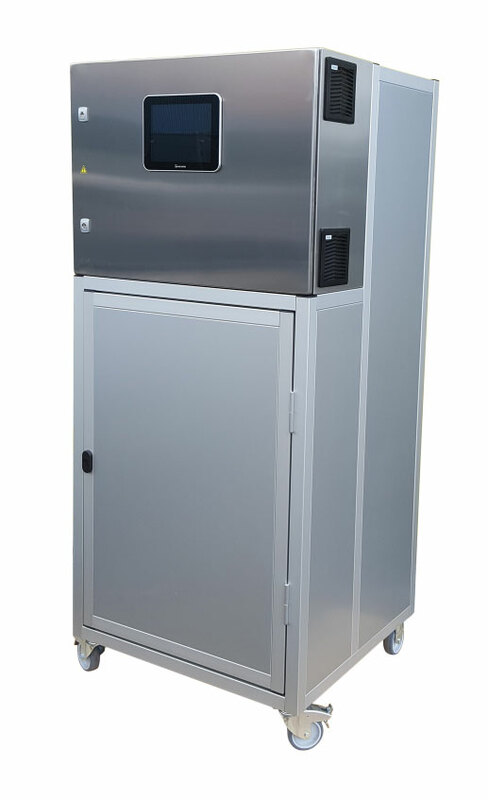 The AQUAOX™ EAW-1 is a compact, self-cleaning, stand-alone mobile cleaning, sanitizing and disinfecting solution generator that includes one proprietary electrolytic cell and ancillary equipment such as pressure reducing valves, flow regulators, filters and measurement devices that monitor the quantity and quality of on-site produced anti-microbial solutions. The EAW-1 is an easy to operate Plug & Play generator. After connecting the power, water and ethernet, the generator is ready to provide automatic, remotely controlled production of electrochemically activated solutions. Our Programmable Logic Controller (PLC) continuously monitors the processes required to produce stable, high-quality, cleaning, sanitizing & disinfecting solutions. With AQUAOX™ Remote Management technology, operators do not need to be present on-site. They can remotely diagnose the operational status of their system, conduct basic maintenance and operate the AQUAOX™ EAW-1 generator without physical operator interface. AQUAOX™ EAW-1 generator users are assured of continuous production/flow of high-quality cleaning, sanitizing & disinfecting solutions. AQUAOX™ Remote Management technology is accessible by Apple or Android powered devices or Window OS on a desk or laptop computer. The AQUAOX EAW-1 generator produces on-site a comprehensive line of superior solutions by electrolyzing a dilute brine solution. Effective against Methicillin Resistant, Staphylococcus Aureaus (MRSA), Swine Influenza Virus (H1V1), Escherichia coli (NDM), Vancomycin resistant enterococci (VRE), Human Immunodeficiency Virus Type 1 (HIV-1), Mycobacterium bovis (BCG), Salmonella enterica and more. 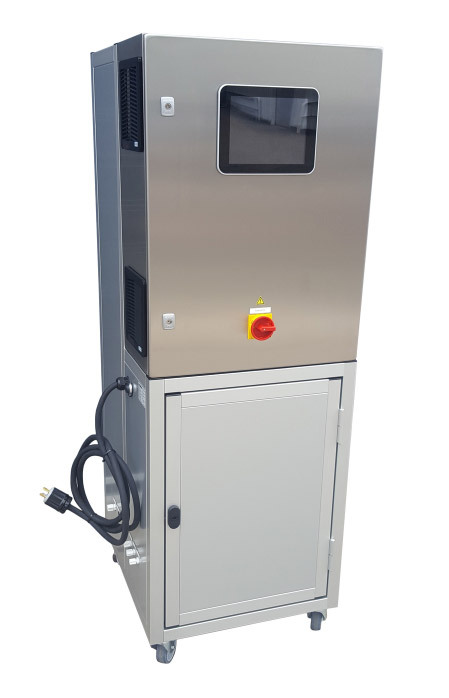 The AQUAOX™ EAW-2 System is a fully-automated, self-cleaning, remote-controlled, on-site generator that produces stable, non-toxic, non-corrosive cleaning, sanitizing and disinfecting solutions for use in various applications such as hospitals, hotels, dairies, breweries, and food processing facilities. The EAW-2 generator includes two proprietary Electrolytic Cells, a remotely controlled EC device and other ancillary equipment. The generator is mounted on a movable rack and includes a water softener, filters, pressure reducing valve, flow regulators, brine tank and cosullecting tanks for temporary storage of cleaning, sanitizing and disinfecting solutions. Our Programmable Logic Controller (PLC) continuously monitors the processes required to produce stable, high-quality cleaning, sanitizing & disinfecting solutions. In the event that any parameters fall outside pre-set limits, the PLC activates an alarm and immediately adjusts the parameters. With AQUAOX™ Remote Management technology, operators do not need to be present on-site. They can remotely diagnose the operational status of their system, conduct basic maintenance and operate the AQUAOX™ EAW-2 generator without physical operator interface. AQUAOX™ EAW-2 generator users are assured of continuous production/flow of high-quality cleaning, sanitizing & disinfecting solutions. AQUAOX™ Remote Management technology is accessible by Apple or Android powered devices or Window OS on a desk or laptop computer. The AQUAOX EAW-2 generator produces on-site a comprehensive line of superior solutions by electrolyzing a dilute brine solution. Effective against Methicillin Resistant, Staphylococcus Aureaus (MRSA), Swine Influenza Virus (H1V1), Escherichia coli (NDM), Vancomycin resistant enterococci (VRE), Human Immunodeficiency Virus Type 1 (HIV-1), Mycobacterium bovis (BCG), Salmonella enterica. 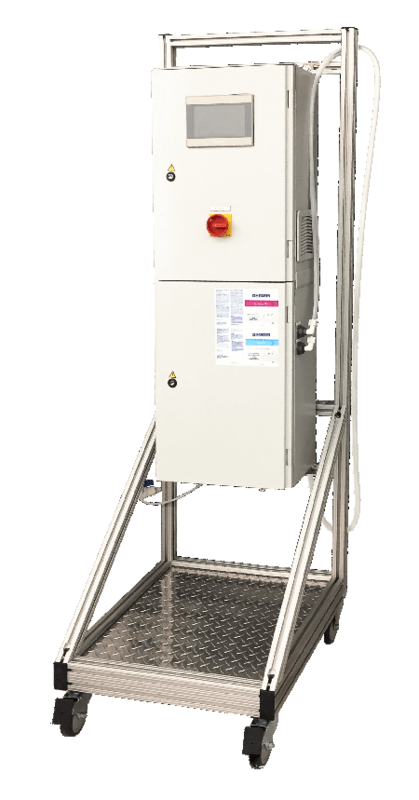 The AQUAOX™ MOW-2 System is a durable, high-efficiency, self-cleaning, on-site generator that produces cost-effective, Mixed Oxidant Water (MOW) solutions for disinfecting water distribution treatment systems. Our Programmable Logic Controller (PLC) continuously monitors the processes required to produce stable, high-quality cleaning, sanitizing & disinfecting solutions. In the event that any parameter falls outside pre-set limits, the PLC activates an alarm and immediately adjusts the parameters. With AQUAOX™ Remote Management technology, operators do not need to be present on-site. They can remotely diagnose the operational status of their system, conduct basic maintenance and operate the AQUAOX™ MOW-2 generator without physical operator interface. AQUAOX™ MOW-2 generator users are assured of continuous production/flow of high-quality cleaning, sanitizing & disinfecting solutions. AQUAOX™ Remote Management technology is accessible by Apple or Android powered devices or Window OS on a desk or laptop computer. MOW solutions are formulated for use in all drinking water systems. When used in conjunction with a primary disinfectant, MOW simultaneously restores chlorine residuals and reduces disinfection by-products by removing the organic and inorganic deposits that react with chlorine and chloramines. MOW is a non-hazardous, proprietary liquid formulation that works conjunctively with or without a corrosion or scale inhibitor. MOW maintains performance integrity without changing water corrosivity. Through calibrated, controlled dosing, potential harmful deposits can be removed slowly without adversely affecting water quality. Water treatment with MOW also improves and extends system and equipment life-cycle performance. The KECA 50 is an innovative, extremely compact, easy to operate on-site generator that produces continuous volumes of safe, stable, powerful, ready-to-use, eco-friendly sanitizing solutions. KECA quickly and efficiently provides all the solutions you need to safely sanitize any high demand environment. The easy-to-use control panel allows you to pre-program the amount of solutions produced or you can hygienically turn on and off generation by a simple wave of your hand. 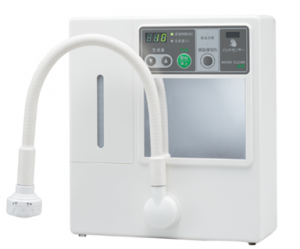 The KECA 50 is an easy to install Plug & Play generator that basically only needs to be connected to a power source and water to start production of high-quality antimicrobial solutions. The compact, lightweight design allows the unit to be used standing on a counter top or wall mounted when space is limited. Traditional sanitizers such as chlorine bleach and quaternary ammonium compounds (or QUATs) are toxic to humans, corrosive to materials and harmful to the environment. KECA 50 sanitizing solutions are user safe, non-toxic, non-corrosive, environmentally friendly sanitizing solutions that can be used anytime and anywhere. The solutions are cost-effective and produced on-site, on-demand from the electrochemical reaction of water + salt + electricity. Schools, Universities, Daycares, Nursing Homes, Medical and Dental Facilities, Gyms, Health Clubs, Spas and Salons, Restaurants, Food Service and Kitchens • Office Buildings, Shopping Centers and Grocery Stores • Theaters, Stadiums, Amusement Parks, Hotels and Cruise Ships, Residential Homes, Beverage and Food Processing Plants and more.